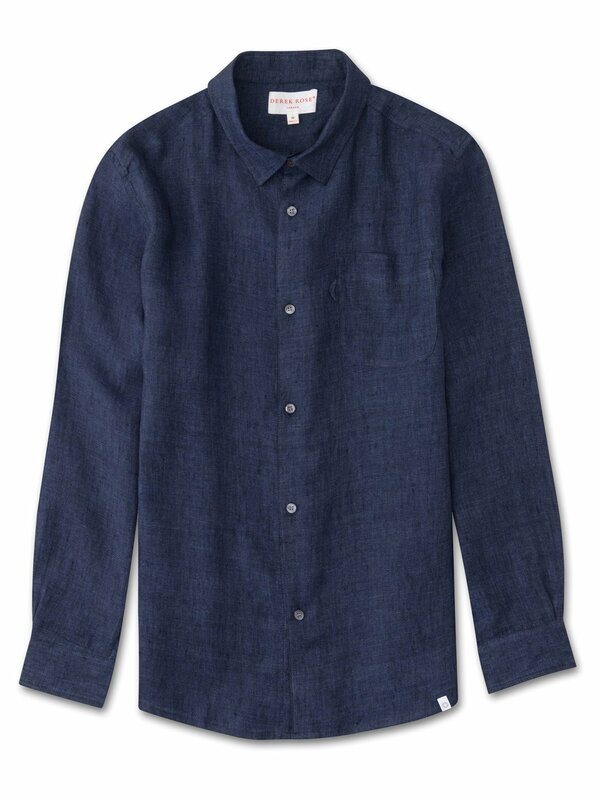 Our Monaco shirt in navy blue is cut for a regular fit for the perfect, warm weather ready style. We have developed a lightweight, beautifully soft and breathable pure linen that will keep you cool and comfortable in even the hottest of conditions. This made in Italy fabric is dyed at the yarn stage for an eventual two-tone melange effect when the threads are combined together. The Monaco shirt features a curved back yoke with a box-pleat for comfort and a curved hem with side vents for ease of movement. We've used the classic styling of a button-through front and cuffs, a 2-piece collar and for a modern addition we've added a U-shaped breast pocket with a handy sunglass loop for effortless summer-chic. Wear the Monaco to and from the beach or as a cool, smart-casual shirt for sultry evening walks and dinner by the sea.